D Tagoe, S Baidoo, I Dadzie, V Kangah, H Nyarko. A Comparison Of The Antimicrobial (Antifungal) Properties Of Garlic, Ginger And Lime On Aspergillus Flavus, Aspergillus Niger And Cladosporium Herbarum Using Organic And Water Base Extraction Methods. The Internet Journal of Tropical Medicine. 2009 Volume 7 Number 1. The study aim at comparing the antimicrobial (antifungal) properties of garlic, ginger and lime on Aspergillus flavus, Aspergillus niger and Cladosporium herbarum using organic and water base extraction. Pure cultures of the test fungal were isolated from rotten vegetables, air spora, and a swab of the skin surface whilst filtered plant extracts were obtained by means of organic (absolute ethanol) and aqueous (distilled water) extraction techniques. The pour plate technique was applied in the antifungal sensitivity testing using Potato Dextrose Agar (PDA) and results obtained by measuring diameter of fungal growth over a 7day incubation period. Growth results showed high but varied levels of antimicrobial effectiveness. Ginger showed the highest antimicrobial effect against all the test fungi (P<0.01) followed by garlic (P<0.05) and then lime (P<0.01) in Aspergillus species but not in effective on C. herbarum (P>0.05) using ethanol extraction. In the water (aqueous) base extraction medium, lime exhibited the highest antimicrobial (antifungal) effect (P<0.01) on all test fungi, followed by garlic (P<0.01) on Aspergillus species, (P<0.05) on C. herbarum whilst ginger was ineffective on Aspergillus species (P>0.05) but highly fungicidal on C. herbarum (P<0.01). Thus water base extraction technique was the most effective in inducing antifungal properties of lime whiles ethanol base extraction technique was the best for ginger. Garlic on the other hand exhibited a good antimicrobial (antifungal) property in both ethanol and water extraction media. The study thus confirms the antifungal properties of these medicinal plants and suggests the type of extraction to yield the best results. The use of plant parts as a source of medicine to treat infectious diseases predates history as a result of which nearly all cultures and civilizations from ancient times to the present day have used herbal medicines to cure infections1. Ethno-pharmacological use of plants prevails among most African countries where plants are used in treating malaria, diarrhoea, burns, gonorrhoea, stomach disorders and other infectious diseases2. These plants which are easily available and cheaper than the conventional drugs include garlic, ginger and lime fruit which in their natural state are widely used in West Africa as herbal medicines3. A report from the World Health Organisation revealed that 80% of the world’s population relies on traditional therapies which involve the use of plants extracts or their active substances4 whilst actively encouraging national governments of member countries to utilize their traditional systems of medicines with regulations suitable to their national health care systems5. Extraction refers to processes for the isolation of the active ingredients from drug material and this may be by physical means or by dissolving in a suitable menstruum (liquid solvent e.g. water or alcohol)6. The extracts (antimicrobial agents) when isolated are contained in the phytochemical constituents (Alkaloids, Saponins, Tannins etc.) of the plants7. Over the years much effort has been devoted to the search for new antimicrobial (antifungal) agents from natural sources such as plants and others for treatments and for food preservation 3, 8-13. The antimicrobial activities of such plant extracts have been linked to the presence of bioactive compounds which sometimes serve to protect the plants themselves against bacteria, fungi and viral infections as well as exhibiting their antimicrobial properties on these organisms14. Allicin in garlic extracts have been found to be effective as an antifungal, antibacterial, antiviral and anti-parasitic agent15. Ginger contains the compound caprylic acid, which has potent antifungal properties and is popularly used to treat conditions like indigestion, nausea, vomiting, sore throats, the common cold, headache, fevers, flu symptoms, rheumatism, and motion sickness16. Lime is also an essential ingredient in the preparation of most herbal concoction which is sometimes used to suppress stomach ache and possess antimicrobial activities in conjunction with other extracts3. Aspergillus species are the most common fungal species which are able to produce mycotoxins in food and feedstuffs and these mycotoxins are known to be potent hepatocarcinogens in animals and humans11. The presence and growth of fungi may cause spoilage and result in a reduction in quality and quantity of foods9-10, 17-19. Most Cladosporium species are causative agents of skin lesions, keratitis, onychomycosis, sinusitis and pulmonary infections20 with the ability to reproduce on frozen meat21. The present study seeks to confirm and compares the antifungal effectiveness of garlic, ginger and lime as both antimicrobial and preservation agents as well as to determine the most suitable extractive technique for effective activity on the test species of A. flavus, A. niger and C. herbarum. The research material ginger, onion and garlic were obtained from Pedu Market in the Cape Coast Metropolis of Ghana whilst laboratory activity was undertaken at the Laboratories of Department of Laboratory Technology and Molecular and Biotechnology of the University of Cape Coast, in Cape Coast, Ghana between December, 2009 to May, 2010. Plant Extraction: 100g of cleaned, air dried plant extracts of ginger, garlic and lime obtained were blended separately and individually soaked in 100mls of ethanol for 24hrs in a sterile glass container. The pulp obtained was shaken vigorously to allow for proper extraction of active ingredients. The crude extract was then filtered using sterile Whatmans No. 1 filter paper. The filtered extracts were then stored in the refrigerator at 40C. The process was repeated using sterile distilled water as the extractive medium. Fungal isolation: Test fungi (A. flavus, A. niger and C. herbarum) were obtained from the School of Biological Sciences, University of Cape Coast, Cape Coast, Ghana. Antifungal Screening Test: Six each of washed, dried and sterilized plates were labeled for each ethanol base plant extracts with two each of the six labeled for each fungi. Six plates were also labeled as positive controls using ethanol only with two plates each corresponding to each test fungi. A further six plates were labeled as negative controls without any antimicrobial agent (plant extract) nor ethanol with two plates corresponding to each test fungi. This makes a total of thirty (30) plates for ethanol extract medium sensitivity testing. 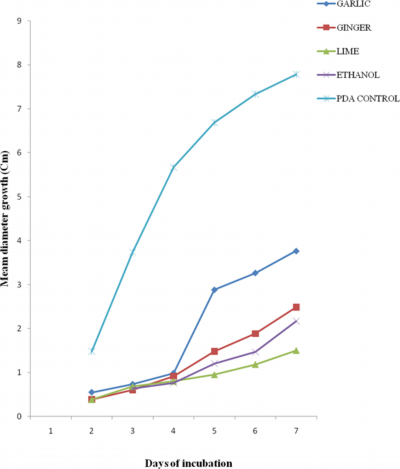 1ml of ethanol base plant extract was dispensed using separate sterilized micropipettes into each extract labeled Petri dish. 1ml of ethanol only was dispensed using another sterile micropipette into ethanol only labeled Petri dishes. Sterilized molten Potato Dextrose Agar (PDA) cooled at 45 ºC was dispensed separately into each of the plates including the plates without plant extract and ethanol. Each plate was swirled gently in a clockwise and anti-clockwise motion to mix the extracts with the PDA and allowed to solidify. A streak of the pure cultures of the test fungi were then transferred unto the Petri dishes containing the PDA and the plant extract using a sterile inoculation needle. The plates were covered and incubated at room temperature at 28±3 ºC for two days after which diameter growth of the test fungi were measured horizontally, vertically and diagonally and mean values calculated. Measurement of diameter was made at daily intervals for six days. The above procedure was repeated for water base plant extraction using distilled water only as the positive control and PDA only without plant extract and water as the negative control. Incubation and measurement were undertaken as described above. Statistical analysis: Data obtained in the study were descriptively analyzed using Statview from SAS version 5 and the means separated using double-tailed Paired Means Comparison. Microsoft Excel was used in plotting the graphs. 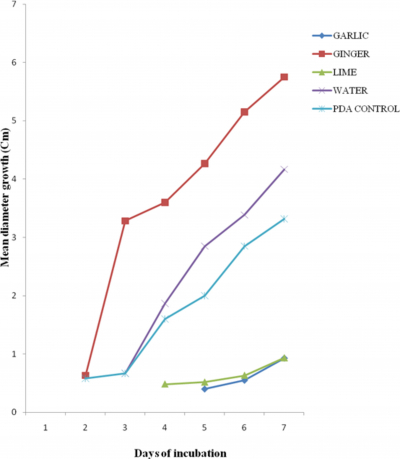 With inorganic water base extraction medium, Garlic had the greatest inhibition in diameter growth (0.934cm), followed by lime (1.150cm) on A. flavus resulting in a marked significant difference (P<0.01) (Table 2) with least growth inhibition in ginger (7.783cm) on the seventh day not significant (Fig. 4). 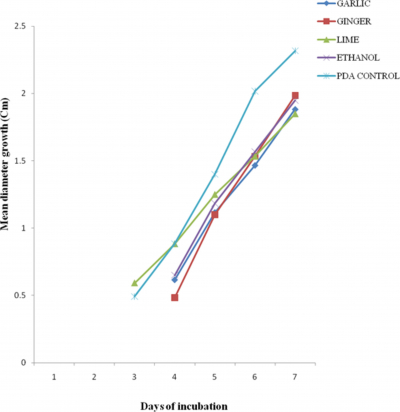 All three extracts significantly inhibit growth of fungi compared with water control (P<0.01). 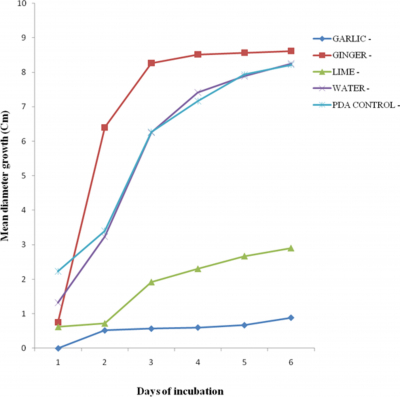 In A. niger, garlic had the greatest inhibition in diameter growth (0.884cm), followed by lime (2.900cm) leading to (P<0.01) whilst ginger (8.617cm) on day seven of incubation resulted in (P>0.05) (Fig. 5). Lime had the greatest inhibition in diameter growth (0.933cm), followed by garlic (0.934cm) and garlic (5.750cm) on C. herbarum at day seven of incubation (Fig. 6). There was was a marked significant difference (P<0.01) between all three extracts and PDA controls. There was significant difference between all extracts and water control. The phytochemical constituents of medicinal plants such as garlic, ginger, lime, onion etc have longed been known and their antimicrobial properties have been widely studied and reported22-23. 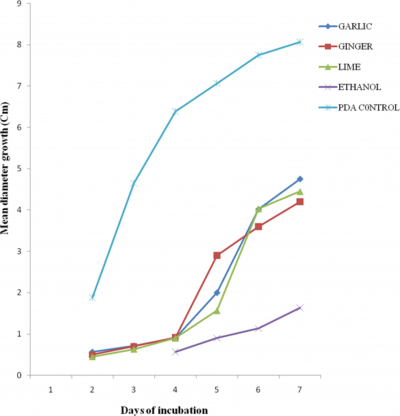 In the ethanol base extraction medium, all three ethanolic extracts of garlic, ginger and lime significantly inhibited growth of A. flavus and A. niger (P<0.01) over the incubation period. This conforms to works by3 on studies on the antimicrobial effectiveness of garlic (Allium sativum Linn), ginger (Zingiber officinale Roscoe) and lime (Citrus aurantifolia Linn) against some gram positive bacteria species and fungal species such A. flavus, A. niger and others. The strong inhibition potential of ginger is attributed to fact that it contains over 400 different compounds a mixture of both volatile and non-volatile chemical constituents such zingerone, shogaols and gingerols, sesquiterpenoids (β-sesquiphellandrene, bisabolene and farnesene) and a small monoterpenoid fraction (β-phelladrene, cineol, and citral)24-25. The antifungal activity of garlic is in agreement with results of26 who found its extracts very effective in inhibiting the growth of Aspergillus species. The insignificant effect of ethanolic extract of lime on C. herbarum compared with garlic and ginger is in agreement with studies by27 who found that lime is effective against some gram positive bacteria and some fungi such as A. niger and A. flavus but slightly or not effective against C. herbarum. The reduced effectiveness of lime could be attributed to the solubility and volatility of its phytochemical components such as monoterpenes, sesqui-terpenes, oxygenated hydrocarbons, monoterpenes, o-cyme (major component), some of which tend to be lost during the process of extraction especially in organic solvents as explained by28. 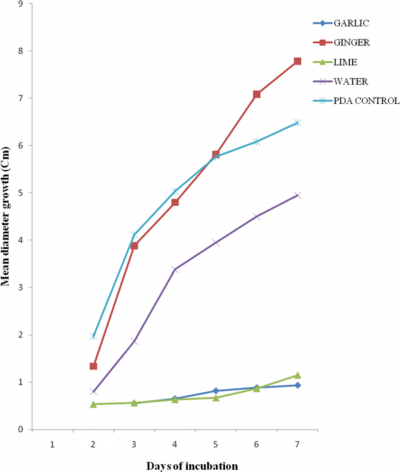 However water extract of lime showed a marked significant difference in inhibiting all three test fungi species (P<0.01) when compared with PDA control. The effectiveness of water (aqueous) extract of lime in inhibiting all three fungi species could be attributed to the fact that water is a polar solvent and the phytochemical constituents of lime such as oxygenated hydrocarbons, monoterpenes, o-cyme (major component) are very soluble in it hence retaining most of the antimicrobial (antifungal) properties during the extraction process as reported by29. In the water base extraction medium, there was a marked significant difference in inhibition of A. flavus and A. niger (P<0.01) between extracts of garlic and lime against PDA control but there was not a significant difference in inhibition of A. flavus and A. niger between ginger extract and PDA control. This results conform to works by30 on the invitro antibacterial activities of crude extracts of essential oils such as is in ginger reporting that most of these oils give better antimicrobial effectiveness in organic extract than aqueous extracts. This could be due to the phytochemical constituents of these plants extracts and their different reactivity, solubility and volatility with organic and aqueous medium. Finally, it could be observed that both ethanolic and water extract of garlic exhibited marked growth inhibiting of all the test fungi (P<0.01) when compared with PDA control. This can be attributed to the fact that allicin, the main phytochemical constituent of garlic, although volatile is very soluble with ethanol and water thereby maintaining it antimicrobial property in inhibiting some gram positive bacteria and some fungi species3, 30. The significant growth inhibitions of the test fungi by the plant extracts suggest their possible use in controlling these fungi in disease causing situations and food spoilage. Furthermore, the easy means of obtaining these extracts especially using water base extraction provides an alternative to antibiotics and artificial preservatives both of which can be toxic at certain concentrations. All three medicinal plant extracts exhibited high but varied antifungal activity and can be used in controlling infection, preventing cold meat spoilage and preserve meat for longer periods against fungal contamination. Different extractive techniques correspond to different antimicrobial (antifungal) effectiveness. However, ethanol and water base extraction of garlic produces similarly strong antifungal activity against all test fungi. We thank the technical staff of the Department of Laboratory Technology and Molecular Biology and Biotechnology. 1. Lino, A, Deogracios, O. The in-vitro antibacterial activity of Annona senegalensis, Securidacca longipendiculata and Steanotaenia araliacea, Ugandan Medicinl plants. Afr. Health Sci. 2006; 6(1):31-35. 2. Oyagade, JO, Awotoye, OO, Adewunmi, JT & Thorpe, HT. Antimicrobial activity of some Nigerian Medicinal Plants. Screening for Antibacterial Activity. Biosci. Res. Communications 1999; 11:193-197. 3. Onyeagba RA, Ugbogu, OC, Okeke CU, Iroakasi O. Studies on the antimicrobial effects of garlic (Allium sativum Linn), ginger (Zingiber officinale Roscoe) and lime (Citrus aurantifolia Linn). Afr. J. Biotechnol. 2004; 3 (10): 552-554. 4. World Health Organisation, Summary of W.H.O. guidelines for the assessment of herbal medicine. Journal of Herbal Gram 1993; 28: 13-14. 5. World Health Organisation. In: Prevention of hospital aquired infections: epidemiology of nosocomial infections. A Practical guide. 2nd Ed. Ducel G, Fabri J, Nicolle L (eds). Malta 2002; pp. 4-16. 6. Parekh J, Jadeja, S, Chanda, S. Efficacy of Aqueous and Methanol Extracts of Some Medicinal Plants for Potential Antibacterial Activity. Turkish Journal of Biology 2005; 29:203-210. 7. Edeoga, HO, Okwu, DE, Mbaebie, BO. Phytochemical constituents of some Nigerian medicinal plants. African Journal of Biotechnology 2005; 4:685-688. 8. Nielsen PV, Rios R. Inhibition of fungal growth on bread by volatile compounds from spices and herbs and mustard essential oil. Inter J Food Microbiology 2000; 60: 219-229. 9. Galvano, F, Piva, A, Ritieni, A, Galvano, G. Dietary strategies to counteract the effects of mycotoxins: Rev. J. Food Protect. 2001; 64: 10-131. 10. Juglal, S, Govinden, R, Odhav, B. Spice oils for the control of co-occuring mycotoxin producing fungi. J. Food Protection 2002; 65: 683-687. 11. Soliman, KM, Badeaa, RI. Effect of oil extracted from some medicinal plants on different mycotoxigenic fungi. Food Chem. Toxicol. 2002; 40: 1669-1675. 12. Boyraz, N, Özcan, M. Antifungal effect of some spice hydrosols. Fitoterapia. 2005; 76: 661- 665. 13. Haciseferogulları, H, Özcan, M, Demir, F, Calısır, S. Some nutritional and technological properties of garlic (Allium sativum L.). J. Food Eng. 2005; 68: 463- 469. 15. Reuter HD, Koch HP, Lawson DL. Therapeutic effects and applications of garlic and its preparations. In: Garlic: The Science and Therapeutic applications of Allium sativum L. and Related species, 2nd ed. (Koch H.P & Lawson D. L., eds.) 1996; 135-212. 16. Ernst, E, Pittler, MH. "Efficacy of ginger for nausea and vomiting: a systematic review of randomized clinical trials”. British Journal of Anesthesia 2000; 84 (3): 367–371. 17. Sahin, I, Korukluoglu, M. Mould-Food-Human. Uludag University Pres,Vipas, Bursa. 2000; pp.3 122. 18. Candlish, AAG, Pearson, SM, Aidoo, KE, Smith, JE, Kell, B, Irvine, H. A survey of ethnic foods for microbial quality and aflatoxin content. Food Addit. Contaminants. 2001; 18: 129-136. 19. Rasooli, I, Abyaneh, MR. Inhibitory effects of thyme oils on growth and aflatoxin production by Aspergillus parasiticus. Food Control. 2004; 15: 479-483. 20. Lestringant, GG, Saarinen, KA, Frossard, PM, Bener A, Ameen AM. Etiology of toe-web disease in Al-Ain, United Arab Emirates: bacteriological and mycological studies. Eastern Mediterranean health journal 2001; 7(1/2):38–45. 21. Piraccini, BM, Tosti, A. White superficial onychomycosis: epidemiological, clinical, and pathological study of 79 patients. Archives of dermatology, 2004; 140(6):696–701. 22. Hasan, MM, Chowdhury, SP, Alam, S, Hossain, B, Alam, MS. Antifungal effects of plant extracts on seed-borne fungi of wheat seed regarding seed germination, Seedling health and vigour index. Pak. J. Biol. Sci., 2005; 8: 1284-1289. 24. Chrubasik, S, Pittler, MH, Roufogalis, BD. Zingiberis rhizoma: acomprehensive review on the ginger effect and efficacy profiles. Phytomedicine. 2005; 12(9):684-701. 25. Grzanna R, Lindmark, L, Frondoza, CG. Ginger—an herbal medicinal product with broad anti-inflammatory actions. J Med Food. 2005; 8; (2):125-132. 26. Dankert, J, Tromp, Th. FJ, Devries, H, Klasen, HJ. Antimicrobial activity of crude juices of Allium ascalonicum, Allium cepa and Allium sativum. Zb. Bkr. Hyg., I. Abt. Orig. 1979; A245:229-239. 27. Khan, MN, Munawar, MA, Mahmud, S, Qureshi AK, Rehman, S. Characterization of essential oil of local varieties of Citrus Grandis. J. Chem. Soc. Pak. 2007; 29 (3) pp. 272–274. 28. Song, HS, Sawamura, M, Ito, T, Ido, A, Ukedo, H. Quantitative determination and characteristics flavour of daidai (Citrus aurantium L. var. cyathifera Y. Tanaka) peel oil. J. Flav. Fragr. 2000; 15 (5) pp. 323–328.